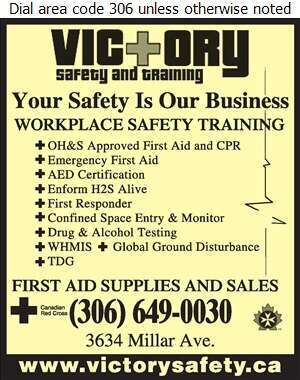 At Victory Safety and Training, quality training, friendly instructors and reasonable rates makes us your best choice for safety training. Our focus is to make safety easy and clear becoming your one-stop shop for your safety and training needs. Since opening in 2008, Victory Safety and Training has been providing Saskatchewan with the tools and training required to make your workplace safer and more efficient. We are ready to serve you through our public course offerings and services in Saskatoon or traveling to your site wherever that may be. We also offer a wide range of online courses.Victory Safety also provides OSSA (Oil Sands Safety Association) training courses; in-house and on-site. At Victory, "Your Safety Is Our Business".